When we do one-day hikes, we often get hungry in the late afternoons. We like to have a meal that not only reminds us of real dinner but also gives us energy. At the same time, it has to be easy to carry and eat. This dish is a perfect match. Serve in pita bread and you can have a healthy dinner ready in minutes. Bulgur wheat is an excellent source of protein, low-fat and low in calories, perfect for an active person. You can substitute the bulgur wheat with quinoa, wild rice or even chickpeas. Pour the water over the bulgur wheat in a bowl and let stand covered, until the water is all absorbed, approx 20 minutes. 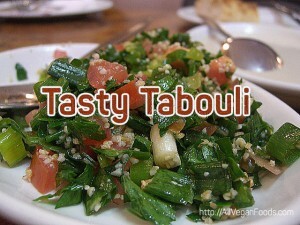 Mix in the parsley, mint green onions, tomatoes and almonds. Stir together olive oil, lemon juice, salt and pepper in a different bowl. Pour evenly over the wheat mixture, toss again.